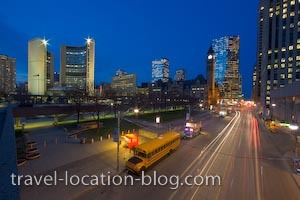 Picture of City Hall and the Nathan Phillips Square at dusk in downtown Toronto, Ontario. City Hall at dusk in downtown Toronto, Ontario. Dusk - a pleasant time in the great metropolis of Toronto - lights are blazing in the high rise buildings such as City Hall and traffic is flowing easily. Old and new city hall buildings and the Nathan Phillips Square in downtown Toronto at dusk, Ontario, Canada.